Is there anything that we love to drink and eat has NO sugar in it? Diet Coke or Coke Zero... Errr... Honestly, I can't list many because I really enjoy my sweet treats. However, after all these years of baking and blogging, I have learned to cook and bake delicious food with healthier options. One is to use the most appropriate amount of sugar to produce food that is still tasting good. Accordingly to Epicurious, there is a large selection of sugar substitutions that we can use. Although all these sugar substitution are zero in calories, some are not heat stable or also bake-able. Among the list, Stevia is one of the natural sweetener that are extracted from the leaves of the plant species, Stevia rebaudiana and it is bake-able! However, it can't be used as a direct replacement of sugar because it does not caramelize the way that sugar does and does not brown or crystallize when heated. As it is 200 to 300 times sweeter than sugar, it is usually used with a reduced form of volume and so it can't bake cakes into tall and fluffy texture. How to bake with less or minimal amount of sugar? 1) Choose a recipe that doesn't require an essential amount of sugar to caramelize, crystallize or form substantial volume. 2) Weigh out the amount of sugar of required first and add into your food little by little. Stop adding when your food is sweet enough for you. 4) Use naturally sweet fruits or dried fruits because they are naturally sweet and so you can use them to sweeten your food instead of adding sugar. 5) Substitute sugar partially with sweeteners. You will get the taste of the best of the both world. In regardless, you have to sweeten your food!!! Please... Life is too short to eat any cardboard food!!! 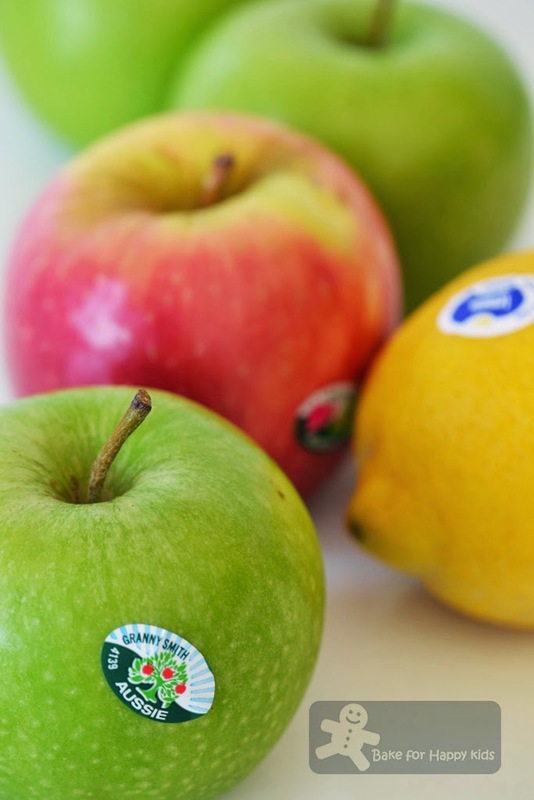 Use fruits that are naturally sweet like apples! 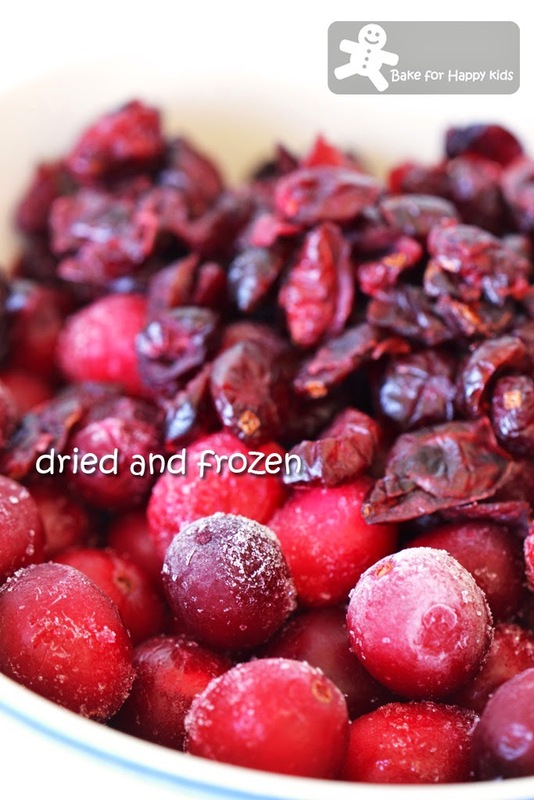 Instead of using just frozen or fresh cranberries, I'm using dried cranberries too for extra sweetness. 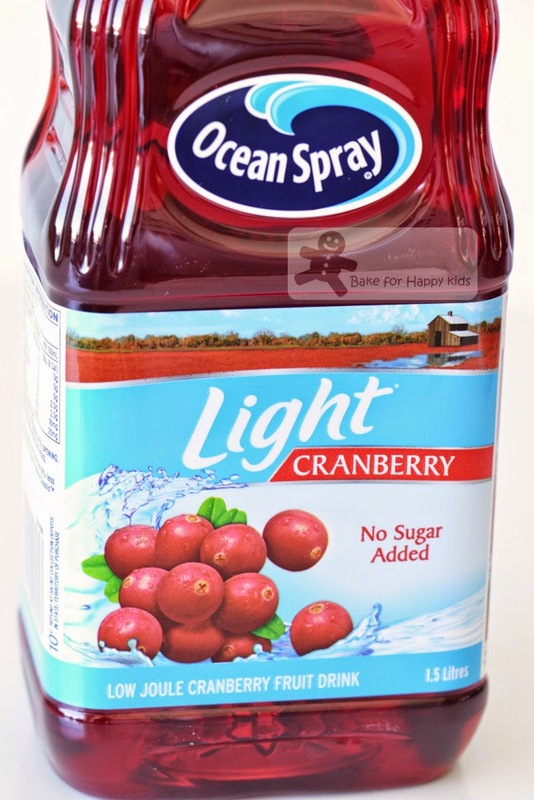 You can use the regular juice with added sugar but I have used this because this is always in my fridge. For this bake, I like to substitute sugar partially with one of these sweeteners. 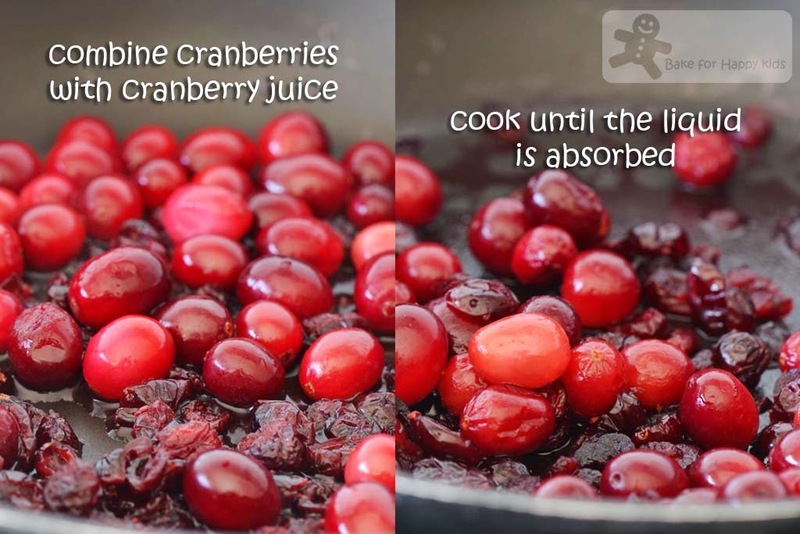 To prepare the filling, cook the cranberries first. Next, cook the apple until soften and add sweetener (or just enough sugar) to taste. This pie dough contains only 1/2 tablespoon of sugar. Line baking cups with cut dough. This minimal amount of sugar and butter on the fruits give the filling extra caramelized texture. These sprinkles of cinnamon sugar give the pastry top nice and crusty golden finishes. They are all "sweet" and yummy! Before proceeding to the recipe, please allow me to elaborate further the use of Stevia for baking. 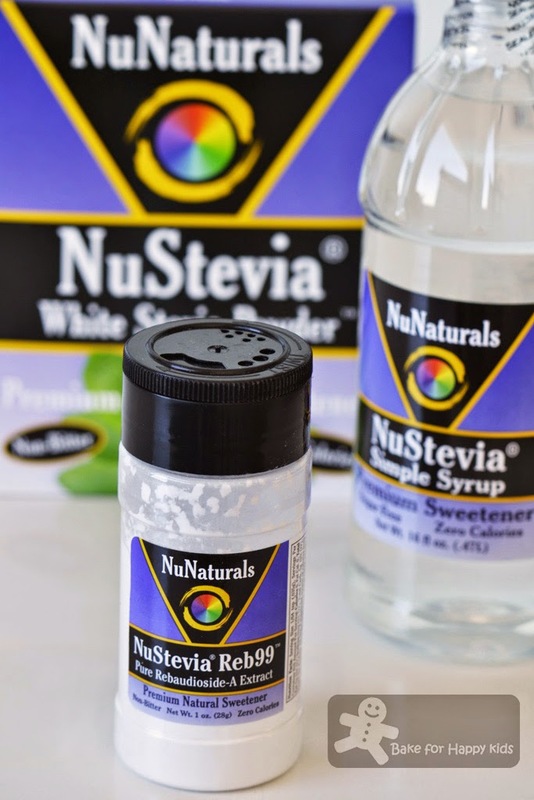 As mentioned before, I like to strongly encourage people with diabetic and weight control problems to enjoy their food better with Stevia as the sweetness of 1g Stevia is equivalent to 2 teaspoons of sugar. However, I like to emphasis that the consumption of Stevia should be in moderation as excessive consumption may cause some side effects for some people especially those with 1) ragweed allergies, 2) low blood pressure or 3) difficulty to control blood sugar levels. Personally, I think that pregnant or breastfeeding women should avoid consuming sweeteners too... Well, this is my very very very personal opinion. Before proceeding on to the recipe, I like to make a disclaimer here that I'm not paid by Nunaturals to promote their products. I was given these samples to try and like to share my most honest opinions to my friends and all readers. Here are the recipes that I have mostly adapted from Epicurious at here and here. Not to worry if you prefer to use sugar instead of using sweeteners to bake these. I have included the amount of sugar that you need to use in this recipe too. 1/2 tbsp caster sugar - I'm not using sugar substitution here. 1 1/2 tsp + 1 tbsp sugar to sprinkle - I'm not using sugar substitution here. I have used 1/2 tsp NuStevia Reb 99. This substitution has reduced a total of 580 calories which is about 50 calories in each tart. I reckon the sweetness of the filling is just right for me but my sweet tooth son said that the filling is still not sweet enough for him but he is happy after I dusted his pies with a light sprinkle of icing sugar just before serving. Using a processor or pastry blender, combine flour, sugar, salt and butter until coarse crumbs forms. Add 3 tbsp of water and process or combine until a dough form. If the dough is dry and crumbly, add more water, 1 tsp at one time. Wrap dough with plastic wrap and refrigerate for at least 1 hr. This can be made up to 2 days ahead. Keep chilled. Soften slightly at room temperature before rolling. Stir half of 3/4 cup sugar (omit sugar if you are using sugar substitution) and juice in saucepan over medium-high heat. Add both fresh or frozen and dried cranberries and bring mixture to simmer. Reduce heat; simmer until almost all liquid is absorbed, stirring often, about 15 mins. Stir in apples, lemon juice, cinnamon and the rest of the sugar (or no sugar if you are using sugar substitution). Cook mixture until apples start to soften, about 10 mins. 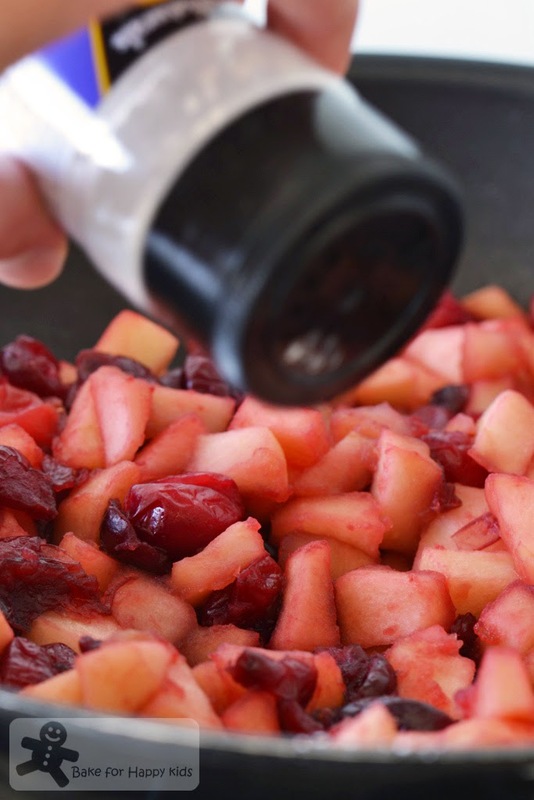 Remove apple mixture from heat. Stir in adequate amount of any sugar substitution if you have not add any sugar. Chill and cover. This can be made up to 2 days ahead. Roll out the dough on floured surface into flat pastry with 5mm thickness. 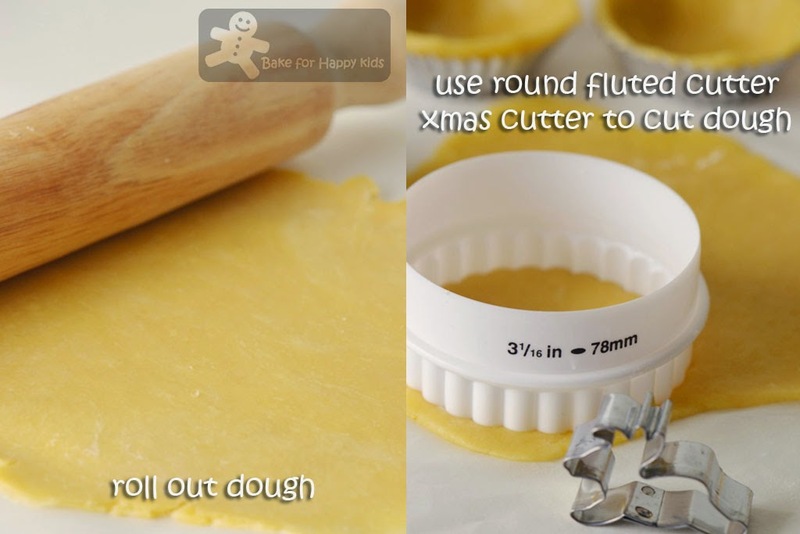 Cut the pastry with a 8cm round cutter. 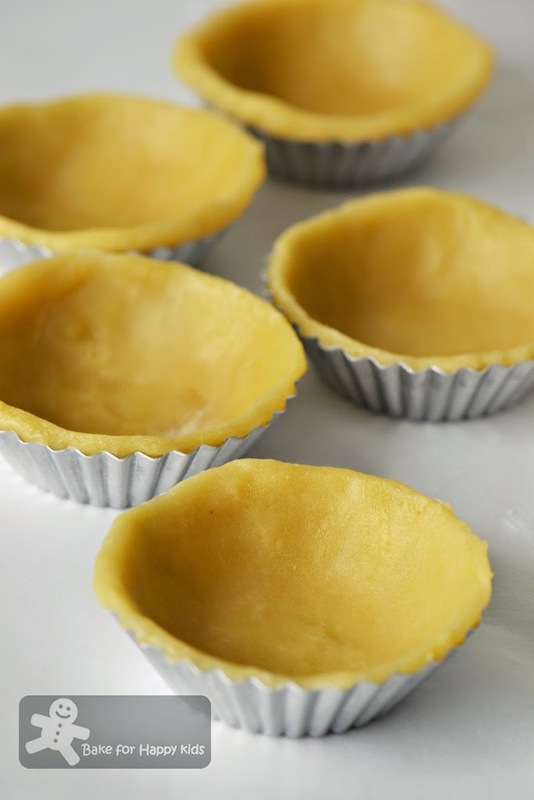 Transfer each round of pastry into each 7cm round baking cups and line the pastries nicely onto the cups. Fill each pastry with enough apple filling. Sprinkle half of 1/4 tsp sugar on the filling. Then, dot the filling with one small slice of butter. Roll out any excess the dough into flat pastry with 5mm thickness. 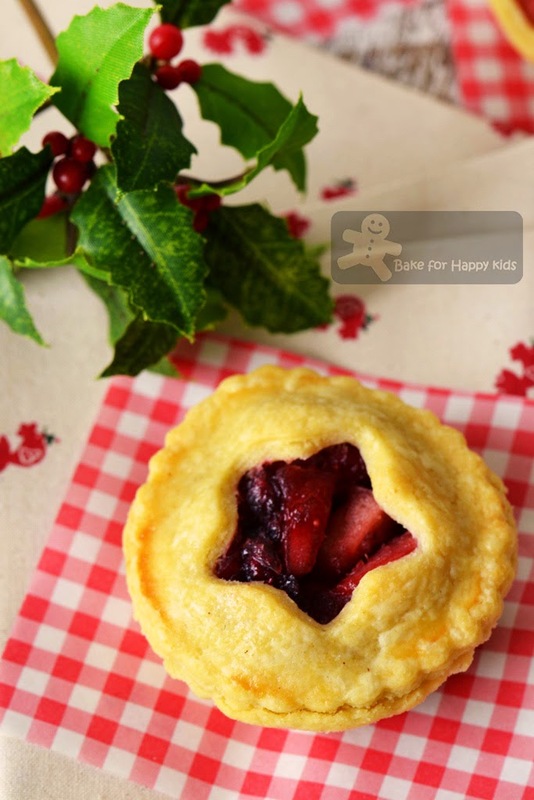 For the pie lid, cut the pastry with a 8cm round cutter and make a slit or use a small cookie cutter to cut a small shape in the center of each round. 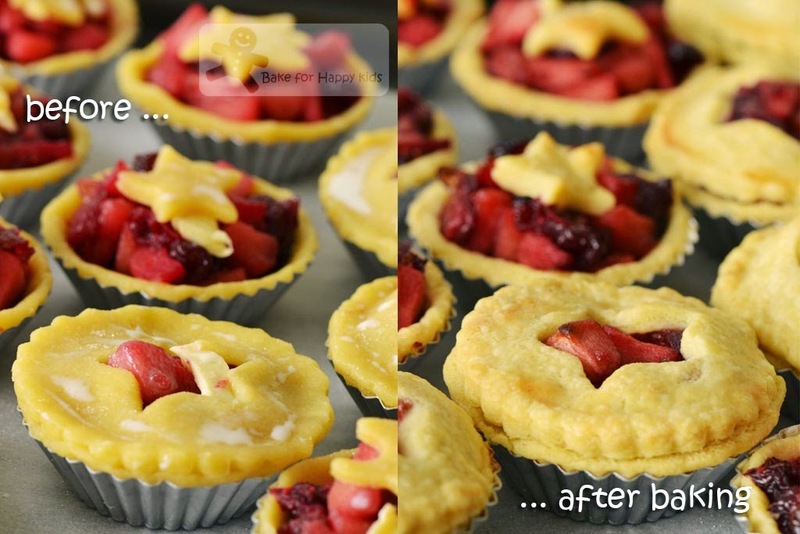 For the pastry shapes, cut pastry with any small cookie cutter. 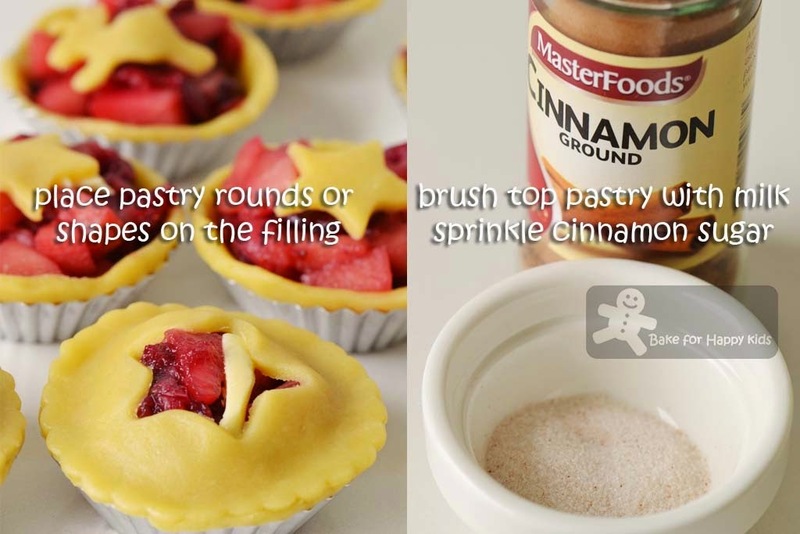 Place the pastry on top of the filling. For the pie lid, press crust edges together to seal; crimp. Chill the assembled pie in the fridge for at least 30 mins. Preheat oven to 400°F, 200°C or 180°C fan forced. Brush crust with milk. Mix remaining 1 tbsp sugar and pinch of cinnamon in small bowl; sprinkle over crust. Bake pie 25 mins or until crust is golden. Allow the pies to cool slightly before transferring them to a wire rack to cool to room temperature. Serve slightly warm or at room temperature with or without vanilla ice cream. I love those star-shaped pastries.. I could only eat the pastries without any fillings, yes! I love those buttery pastries, and I could finish all of them, no problem..I love your last picture, look at those fillings oozing out, oh my, I could lick all that off in seconds! Zoe, your mini pies are really cute! Yeah, we have to strike a balance between yummy and healthy. Love, love, love! Super love these pastries!! These look sooo stunning and so pretty! Perfect for the festive year end mood! I love how small and cute they are! I really must bake more pies! The pies look so pretty and they must be very tasty with all the fruit filling. Hmmm.... yummm.... Love your mini pie so much. Looks so festive. I wanna to make some too. A lot of good stuff here! And we'd opt for using sugar -- many of the substitutes are quite good, but there's nothing wrong with sugar in moderation for most of us (not for everyone, obviously). It's that moderation thing that's too often the problem, though! 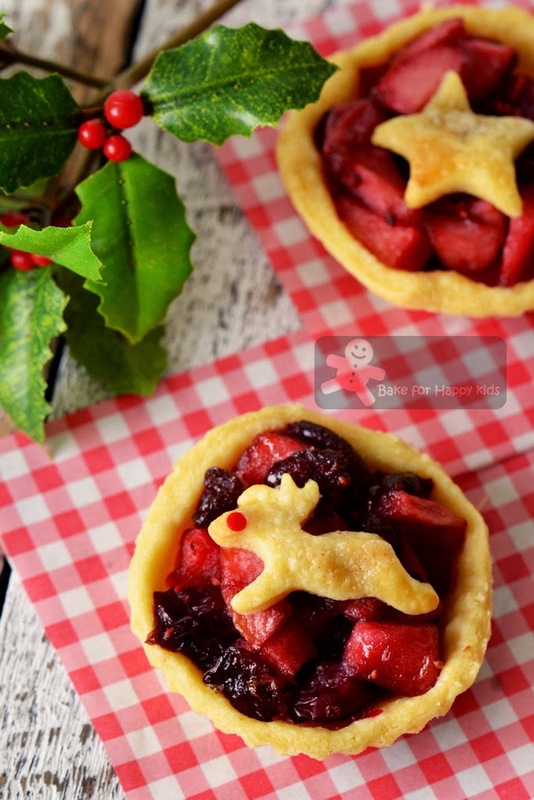 Cute & yummy, perfect for the holidays! Zoe, your blog is always so informative! 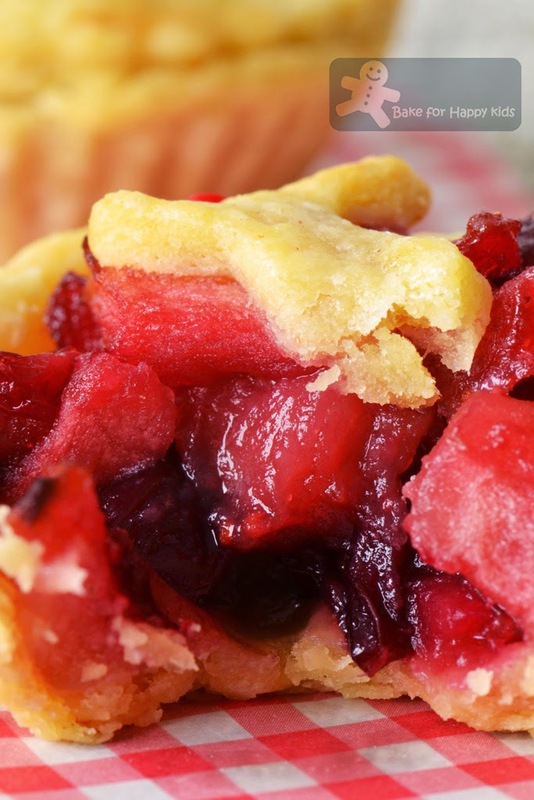 and love your cranberry apple pie, the fresh cranberries looks so red and delicious! Hi Zoe, love the fact that lots of delicious fruits are used to sweeten bakes! I feel less sinful and less fat just by looking at your delicious pies, yum! 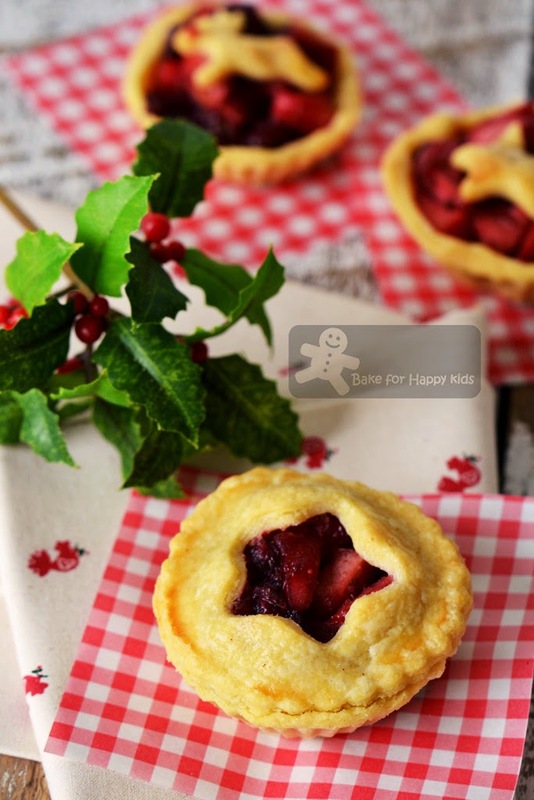 Oooo Zoe, your mini cranberry apple pies looks so cute and nice! Btw my husband always makes better desserts than me cos he always follows the recipe whereas I like to cut down on the sugar cos the amount in recipes simply scare me sometimes! Even my son says "omg is tht how much sugar is going into our cake"? LOL! Zoe I really love your pies and the 2 things I have learnt from this post - (1) placing butter to give the pie a bit more caramalization and (2) alternating the tops of the pie so nothing is wasted! This is such a lovely bake! I really love them so much.